Iran will soon witness a significant boost in its industrial output. Led by a resurgence in the auto sector, the country’s factories are receiving new investment, as major multinationals seek domestic and regional dominance across market sectors. Volkswagen will be building models in partnership with Mammut Khodro, while Mammut Diesel expands its production of Scania trucks. Renault will manufacture trucks in Iran with local partner Arya Diesel. Volvo has signed an agreement to build trucks in partnership with Saipa Diesel. The finalization of Renault’s long-awaited agreement to establish a new manufacturing joint-venture in Iran is expected soon. Peugeot, Daimler, and DAF are also also exploring local production. 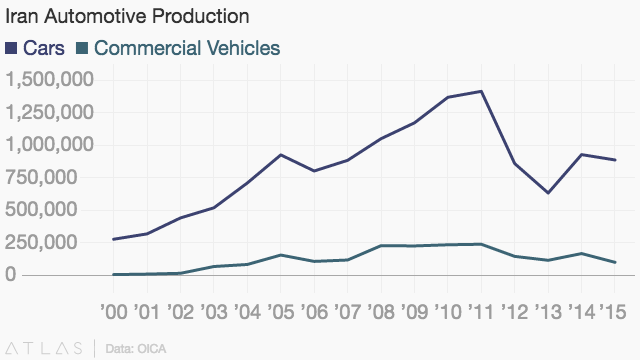 As the boom in passenger and commercial vehicle production in Iran picks up steam, a rather simple question remains unanswered—Who will build all of these new vehicles? Iran boasts one of the largest blue-collar workforces in the Middle East. 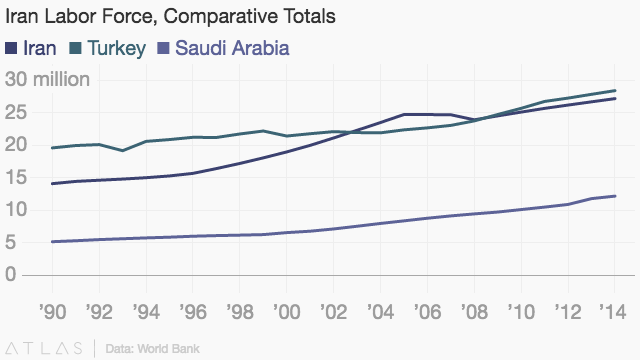 On the back of a population boom that began following the Islamic Revolution of 1979, Iran’s labor force has surged to reach over 27 million, roughly the same size as the labor force of Turkey, and over twice that of Saudi Arabia. The Iranian economy has struggled to absorb the influx of new workers, and the official unemployment rate remains stubborn at between 12%-14%, although some analysts believe the total is even higher. This simple fact explains two fundamental aspects about the dynamism of Iran's political economy. Firstly, the blue collar working class underpins significant consumer buying power. Secondly, the perseverance of Iran’s political diversity cannot be overlooked, especially not in a region where most such diversity has withered away. Relief for blue-collar workers was fundamental to the early success of the win-win formula that drove the nuclear negotiations between Iran and the P5+1. The initial sanctions relief provided to Iran as part of the Joint Plan of Action (JPOA) focused on sectors which accounted for Iran’s largest employers, including the automotive sector. This was a direct result of advocacy of deal supporters in Washington, who argued that galvanizing Rouhani’s political base required showing tangible benefits to Iran’s blue-collar workers. As a result of targeted sanctions relief, the production of automobiles and commercial vehicles in Iran rebounded from 743,680 units in 2013 to 1,090,846 units in 2014, with year-on-year growth swinging from a 25.6% decrease to a 46.7% increase. This early success may have been the single-most important factor in validating the Rouhani administration’s gamble on diplomacy. In the subsequent years, however, the importance of Iran’s blue-collar worker has been largely forgotten by business leaders and policymakers working on the implementation of sanctions relief. These stakeholders remain fixated with the Iran Deal’s role in the “Great Game” of the Middle East, and business leaders are focused on the intricacies of compliance and financing challenges as they approach Iran. In both cases, the international media is happy to play into the blind spots of the respective parties. The struggle of the blue-collar laborer is one of the few truly universal experiences left in the world. The international fraternity of laborers is bound by a common set of anxieties which exist as much in Iran, as they do in Europe and the United States. These concerns range from access to healthcare to economic fears—all of which culminates in the stressful and all-consuming uncertainty of providing for one’s family. The health risks faced by Iranian workers are well-documented in Iran’s extensive body of public health research. Issues include exposure to toxins, severe back and neck pain, and the workplace accidents. Most of the completed studies were based on research originally conducted among worker populations in Europe and the United States. The findings consistently suggest that the incidence of health issues adds considerably to the work-related stress of blue-collar workers, diminishing overall satisfaction with quality of life. Alongside health concerns, Iranian blue-collar workers, both male and female, bear the fundamental burden of providing for their families. In this regard, there remains considerable skepticism of senior management. A 2013 study which looked at the sentiment of workers from at Iran Khodro and Saipa, Iran’s two largest automakers, found that staff report “top management commitment” to high standards “is not positively related to staff degrees of freedom of choice” for the workers. This means that while the managers at Iranian auto companies may demonstrate their commitment to their staff with training programs and performance-based remuneration opportunities, Iranian auto workers still feel they are at the mercy of their superiors, ultimately hurting overall employee satisfaction. Given that Iran does not permit organized labor, this feeling of vulnerability is especially acute, particularly when companies are late making payroll or fail to improve safety standards. In the West, the power of working class voters has reasserted itself with the Brexit referendum outcome and the election of President Trump, who boasted of his commitment to America's "forgotten man"—the blue-collar worker—in his inaugural address. Elections in France and Germany also loom large. Behind these electoral shifts is a heightened awareness of the malaise in the working-class heartlands of these countries. Yet while the frustrations of the working class are now better understood by voters across the political spectrum, the mere existence of the working class in economies such as Iran has not been fully acknowledged in these countries, despite the remarkable similarities in the Iranian blue-collar experience. The only substantive difference between the Iranian and Western working class is that the two groups are demanding opposing solutions from their governments. Whereas voters in the United States and Europe are pushing for a protectionist turn in economic policy in order to protect jobs and wages, working-class voters in Iran have given their mandate to a plan which hinges on the forces of globalization. Having experienced the abject failure of protectionist policies in the Ahmadinejad administration, when Iran’s industrial output cratered under international sanctions and general mismanagement, Iran’s working-class is betting on the success of a different approach. As the Iranian presidential election looms, a renewed mandate for the Rouhani administration will depend on the ability to demonstrate that sanctions relief has created high-quality employment opportunities, particularly for younger Iranians who face the highest levels of joblessness. Rouhani has succinctly described his vision in stating that “The future path of the Islamic Republic of Iran is the path of economic growth, non-oil exports, attracting domestic and foreign capital, and creating jobs for the educated.” Taking his statement as a “to-do” list, the Rouhani administration has already unlocked economic growth through economic reforms and revitalized non-oil exports through the lifting of sanctions and stimulus programs. Today, domestic and foreign investor capital is slowly being deployed. Job creation, of the kind that supports social mobility, is the remaining objective. Troublingly, working-class voters in the West are empowering political parties that are either ambivalent or openly antagonistic towards the Iran Deal. In the United States, public sentiment towards Iran remains dire, with American voters considering Iran their second greatest enemy, only after North Korea. Many of these voters fail to recognize that their own job security could be tied to the trade opportunities represented in post-sanctions Iran. They are also unaware that the potential failure of the Iran Deal would principally hurt fellow blue-collar workers who are similarly at the mercy of forces beyond their control. The great irony is that if there is indeed a breakdown in Iran’s new, improved relations with the international community because of electoral apathy in the West, it is Iran’s blue-collar workers who will be the first to suffer. Should sanctions "snap back", the layoffs in the manufacturing sector would be swift. In the event of possible global political conflict, Iranian conscription would draw indiscriminately from the ranks of its blue-collar labor force. In some sense, the full range of stakeholders, including business leaders, policymakers, and the media, continue to look at the Iran Deal through a lens that dates back to 2016 when JCPOA was formally implemented. The ground has shifted since then and new ways are needed to think about the Iran Deal in the current political and economic climate. By connecting the fortunes of blue-collar workers in Iran with those of their Western counterparts, a more powerful model of normalization might be found.